The United Kingdom has taken a further step towards re-constituting its fixed-wing carrier strike capability with the first take-off of an externally loaded Lockheed Martin F-35 Lightning II Joint Strike Fighter (JSF) from a representative ‘ski-jump’. The test, which took place in early August, saw a short take-off and vertical landing (STOVL) F-35B loaded with a UK-specific mix of four Raytheon Paveway IV precision-guided munitions and two MBDA Advanced Short-Range Air-to-Air Missiles (ASRAAMs) take off from a launch ramp of the type that will be fitted to the United Kingdom’s two new Queen Elizabeth-class aircraft carriers. As noted by BAE Systems in its Twitter announcement of the test, aircraft BF-02 was piloted by the company’s chief STOVL test pilot, Peter 'Wizzer' Wilson. 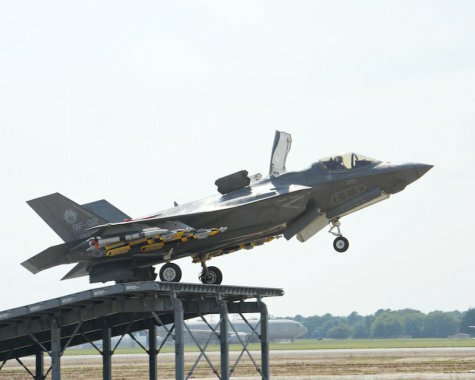 This test at Naval Air Station (NAS) Patuxent River in Maryland is part of a wider campaign to validate for the F-35B the ‘ski-jump’ launch technique that was first developed by the United Kingdom to launch its Sea Harrier jets from the decks of through-deck cruise carriers in the late 1970s. This method enables the aircraft to take off with more fuel and/or weapons, and provides an extra safety margin compared with the US Marine Corps’ (USMC) system of launching from a flat deck. This is especially true during rough seas, when the ship will be pitching up and down.